Multistate outbreaks of Salmonella infection in humans have led the Centers for Disease Control to advise caution when interacting with poultry. A press release on June 1st mentioned eight multistate outbreaks connected to backyard flocks. As of May 25, 372 people in 47 states were reported infected with the outbreaks' Salmonella strains. That means this year could be as bad as 2016, a record year, for salmonella outbreaks with 895 people infected. While none of the outbreaks in 2017 have caused fatalities so far, outbreaks in 2016 led to three deaths. Salmonella outbreaks have increased in recent years as the keeping of backyard poultry grows more popular. The Salmonella-carrying birds in this year's outbreaks came from a variety of sources. They were reportedly purchased from multiple hatcheries, feed stores, websites, and from owners' relatives. The strains involved in the outbreak are Salmonella Braenderup, Salmonella Hadar, Salmonella Enteritidis, Salmonella I 4,5,12:i-, Salmonella Infantis, Salmonella Indiana, Salmonella Mbandaka, and Salmonella Typhimurium. The outbreaks are being investigated by the CDC, the U.S. Department of Agriculture's Animal and Plant Health Inspection Service, and multiple state health and agriculture departments. Backyard chickens and other birds are sometimes treated more like pets than livestock, and that can lead to Salmonella infection/exposure. Even animals that seem healthy can be carrying Salmonella and can infect people; the environment where they live can also become infectious. Children (despite the likely appeal to them of soft, cuddly ducklings or chicks) and the elderly are advised to not have contact with backyard poultry. 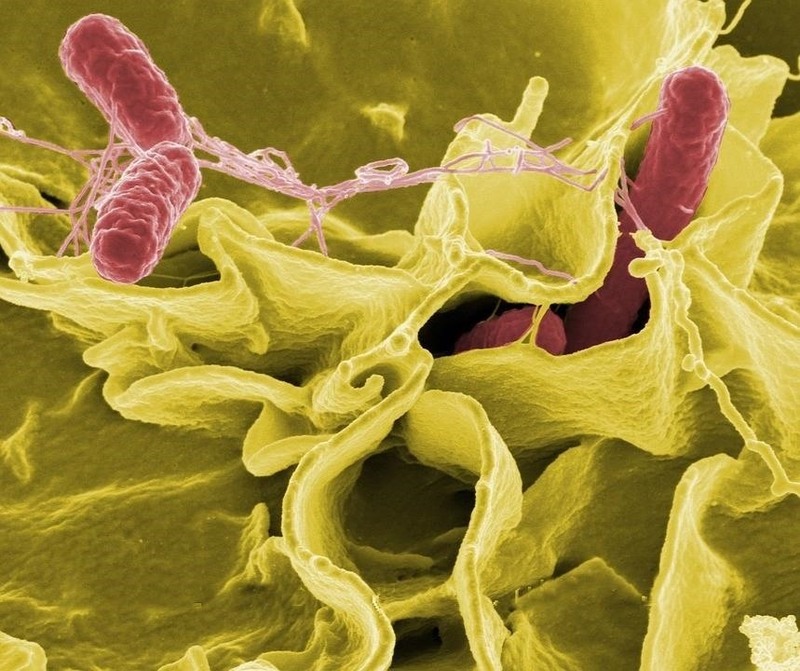 36% of those ill with Salmonella are under five years old. To prevent transmission of Salmonella from birds to humans, "do not snuggle or kiss the birds," the CDC says. People should also keep livestock areas separate from their own living areas. Food should also not be near livestock. Wash your hands immediately after contact with poultry, and if soap and water are unavailable, use hand sanitizer and then wash your hands as soon as possible. To collect eggs safely, they should be collected often and refrigerated immediately after. Any cracked eggs should be thrown out. Eggs can be cleaned with materials like fine sandpaper, a brush, or cloth; do not wash them, as water can bring bacteria to the inside of an egg. Eggs should also be cooked thoroughly before being eaten. Other guidelines and information are available on the CDC's website. News: Do the CDC's Suggested New Quarantine Rules Give Them Too Much Power? Contest entry: rice cooker chicken!